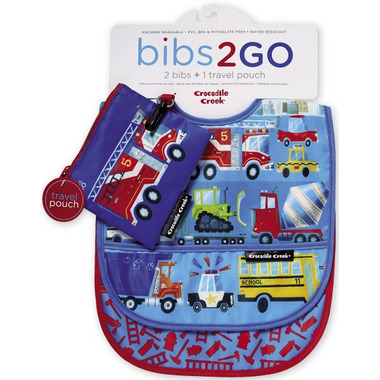 An innovative 2-pack bib set that comes with a zippered travel pouch to hold clean or soiled bibs for parents on the go! Pouch easily holds 2 bibs. Made from lightweight, easy-wipe, machine washable, water-resistant Polyester twill. For babies 6M-24M. Features an adjustable tug-proof hook-and-loop fastener closure and a catch-all pocket that helps to contain spills! 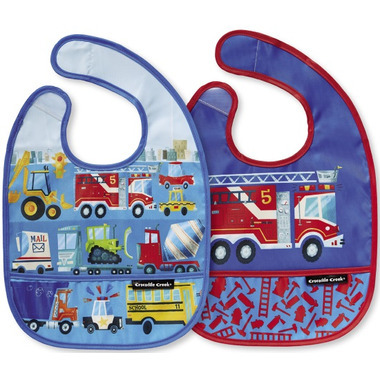 All Crocodile Creek bibs are BPA free, phthalate free, lead free. Cute and I like the pouch that comes with but they are a little on the small side for my 8 month old who is doing BLW. The bumkins cover more of his upper body.